How to make it: Preheat a broiler. Place the poblano chilies on a baking sheet. Broil, turning as needed, until the skins blacken and blister. Remove from the broiler, cover the chilies loosely with aluminum foil and let cool for 10 to 15 minutes. Working under cold running water, peel away the skins. Slit lengthwise and remove the stems, seeds and ribs. Pat the chilies dry and then dice them. Set aside. Pour the milk into a heavy saucepan. In a small, dry fry pan over high heat, toast the cumin seeds, shaking the pan constantly until they are aromatic and begin to change color, about 4 minutes. Remove from the heat and immediately add to the milk. Add the chipotle chilies, bay leaves and rosemary and place over low heat. Cover and bring to a gentle simmer; do not allow to boil. Remove from the heat and let stand, covered, for 20 minutes. Meanwhile, in a stockpot over medium heat, melt the butter with the olive oil. Add the onions and salt and sauté, stirring, until the onions are soft and golden brown, 15 to 20 minutes. Reduce the heat to medium-low, add the garlic and ground cumin, and sauté, stirring constantly, until aromatic, about 5 minutes. 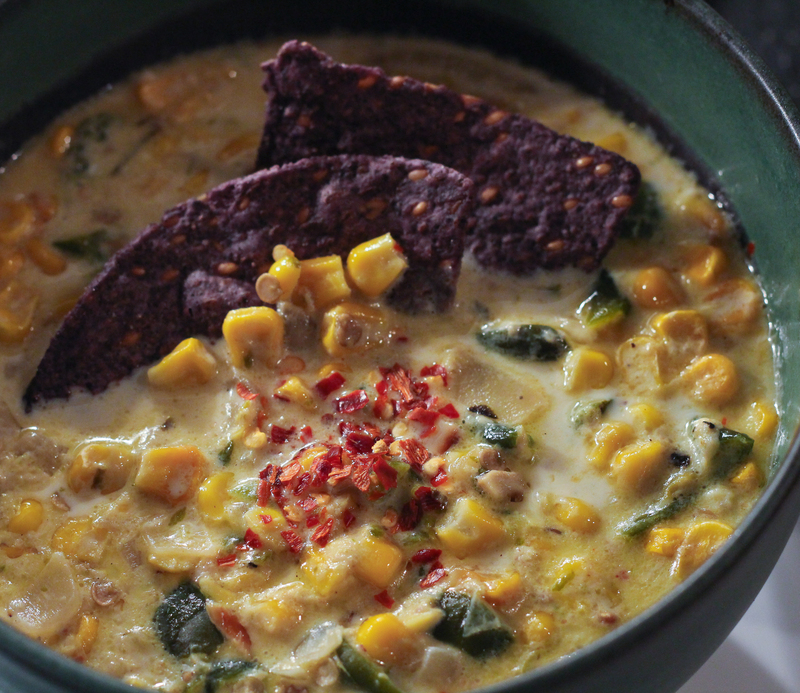 Stir in the corn and poblano chilies, and continue cooking until the corn is lightly browned, about 5 minutes. Using a chinois or other fine-mesh sieve, strain the milk into the corn mixture. Bring to a gentle simmer and continue to simmer until the flavors have melded, about 15 minutes. Remove from the heat and let cool for a few minutes. In a food processor, puree one-third of the soup. Return the puree to the stockpot, stirring well. If necessary, place over low heat to reheat gently. Taste and adjust the seasonings. 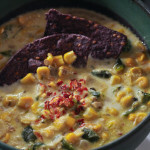 Garnish with the green onions and additional Sensible Foods Sweet Corn and serve. Enjoy.